Fair enough — there’s no denying Landon Donovan’s game-winning goal was a beauty. But if Donovan dug deep, we’d like to dig deeper. Wednesday’s game saw the Galaxy go down 1-3 in the first half, doing their best to look like a team on the verge of a slump. But then the second half happened. Three goals in 25 minutes, and a resounding win that left the Rapids reeling. That’s a good story – a great one, if you’re an LA fan – but it’s just that: a story. What happened at halftime that revitalized the game? What’d Bruce Arena say in the locker room? What, exactly, changed? LA started the game rather poorly, moving the ball primarily down the flanks. This has been their MO since moving into a flat 4. 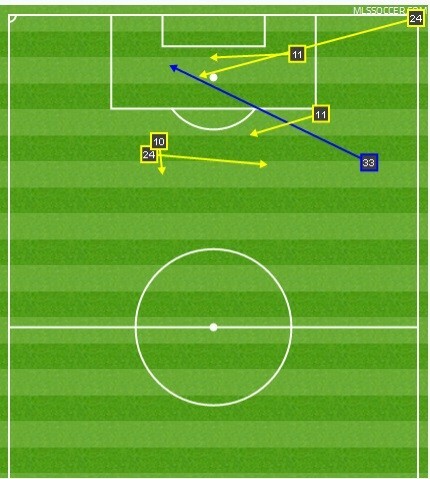 Here are all the successful passes from our two center-mids, Marcelo Sarvas and Baggio Husidic, in the first half. Remember, the number in the center of the square corresponds to the number of the player passing the ball, so number 8’s are passes by Marcelo Sarvas, while number 6’s are passes by Baggio Husidic. 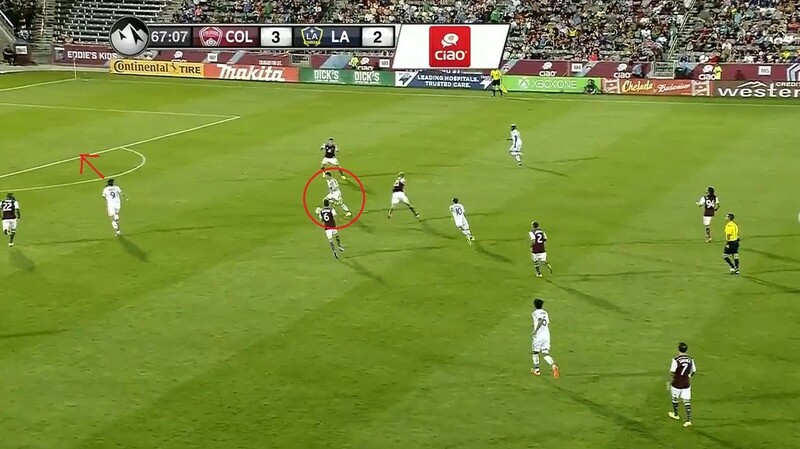 As you can see, both center midfielders primarily shuttled the ball to the wings during the first half, however, without the speed of Robbie Rogers opening up space for Landon on the left side, Colorado was able to effectively shut down LA’s primary chance creator, as well as the entire left side of LA’s attacks. This can be clearly seen in the lopsided nature of the following diagram of LA’s chance creation in the first half. 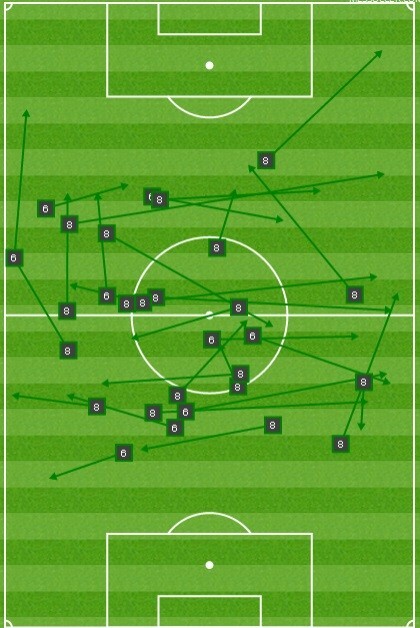 The yellow passes are key passes, and the blue passes are assists. As you can see, absolutely nothing was happening down the left. Another thing you will notice is that number 7, Robbie Keane, is completely absent from this chart. With Husidic and Sarvas mostly shuttling the ball sideways, Robbie Keane was simply not receiving the ball at his feet enough in the final third, to assert his influence on the game. In the first half, Robbie only had 8 passes and only 4 from a central position in the attacking third. It was a brutal first half. With LA’s two primary playmakers having marginal influence on the game, LA needed to make a change. And they did. In the second half the Galaxy abandoned flank play and reverted to their old bread and butter — attacking down the center. This change came about through the center-mids. Instead of continuing to shuttle the ball to the flanks, Sarvas, Husidic, and later Juninho, began making direct, forward passes from central positions. The difference can be clearly seen by comparing their first half pass charts (left) with their second half pass charts (right). Here’s what that looks like on the field. Marcelo Sarvas is on the ball; Keane drops back and presents himself as the main attacking outlet. The result was an explosion of dangerous play as Robbie Keane started receiving and sending passes in dangerous positions. On the left are his first half passing charts. On the right are his second half passing charts. Green passes are complete. Red passes are incomplete, yellow are passes which lead to a shot, and blue passes are assists. Here, Sarvas gets the ball to Keane, who’s drawn a defender towards him. This opens the channel for Zardes. Wynne steps to cover Zardes leaving Donovan’s run unmarked. Keane slots it to Donoavn, and Donovan takes a good shot and very nearly has a goal. Keane receives a throw-in in a similar position and is able to feed the ball to Gordon who wins a corner. The following corner results in the ball being reset, and crossed in again, leading to Gordon’s equalizer. The perfect example came in the form of Donovan’s goal. Marcelo Sarvas feeds the ball directly to Keane, whose withdrawn positioning pulls a center back with him, opening a channel for Donovan to exploit with his brilliant run. Do yourself a favor and rewatch this goal. In fact, rewatch it every day until you die. It’s that pretty. So what can we learn from this second half comeback? For me, the take away is simple — start mixing up the attack. Not in terms of personnel, but in terms of approach. LA used to simply be an up-the-gut system. After a couple of multiple goal performances, the diamond was heralded as LA’s best system. But then teams started packing the middle, and its flaws were exposed. 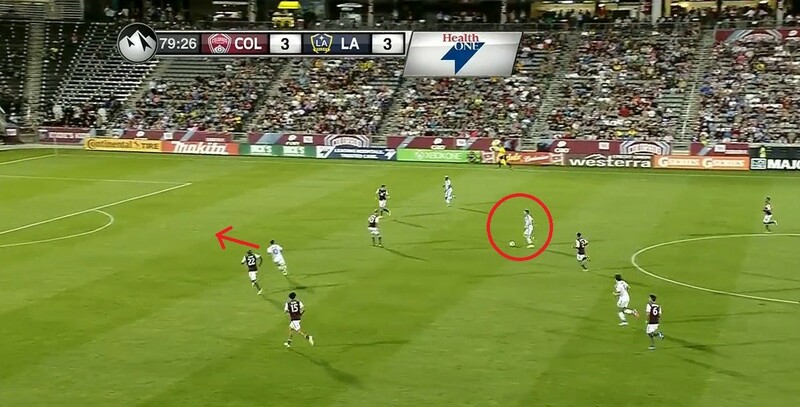 Then LA switched to a flat four with Robbie Rogers and Landon Donovan manning the left side. The result was back to back three goals performances against Seattle and Portland, leaving everyone to declare that the new wing-heavy system was LA’s best. But teams got wise and responded with extra cover on the wings. Failure to adjust to this has been LA’s folly in the last 2 ½ games. The Galaxy are a team that has demonstrated a lethal ability to unlock teams down the center and from the flanks, but have been frustratingly one note in both endeavors. Coaches are not the only people responsible for altering a team’s tactics. Players, too, shoulder that responsibility, and are charged with the task of recognizing faults and adjusting, mid-game.